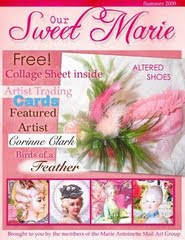 The Marie Antoinette Mail Art Group that I belong to just published this beautiful Our Sweet Marie Zine pictured above. Cassandra Van Curen from My Artful Adventures is our group's fearless leader and is also the brains behind putting this beautiful publication together. The zine is jam-packed with 71 pages of inspiring Marie themed artwork. And the best part about the whole thing is that the zine is available to you absolutely FREE (yes, you heard me correctly) by clicking here. Kudos to Cassandra for under-taking such a monumental task and executing it beautifully! In addition, Cassandra is celebrating her 100th post with a giveaway and a blog party too! She is hosting The Haunted Masquerade Blog Event today. You can read all the details here and be sure to click on the links in her sidebar for other's participating in this event. I guess I'm the first to visit. I love your Halloween tag! It's beautiful! I'm visiting all the hauntingly beautiful blogs and glad I stopped by. Thanks so much for the post! I simply LOVE your Halloween Maire collage wow LOVE IT! I love your Halloween card. Beautiful! Flying around and visiting Cassie's party goers! Fabulous place you have! I enjoyed my visit! Your collage is beautiful! Have a Happy Halloween! Happy Halloween to you. I have enjoyed my visit to your blog. I hope you have a lovely new week. What a BEAUTY! Having fun hopping around the party spots. 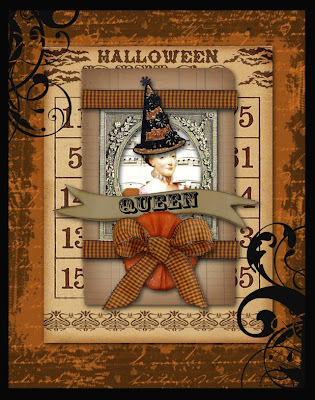 Jeanne, your halloween queen is gorgeous...thanks of the info about the zine...i will have to check that out!!! Yo managed to make Marie look haunting...your tag is beautiful! I haven't had a chance to really check out the zine yet but I did see a lot of beautiful works.